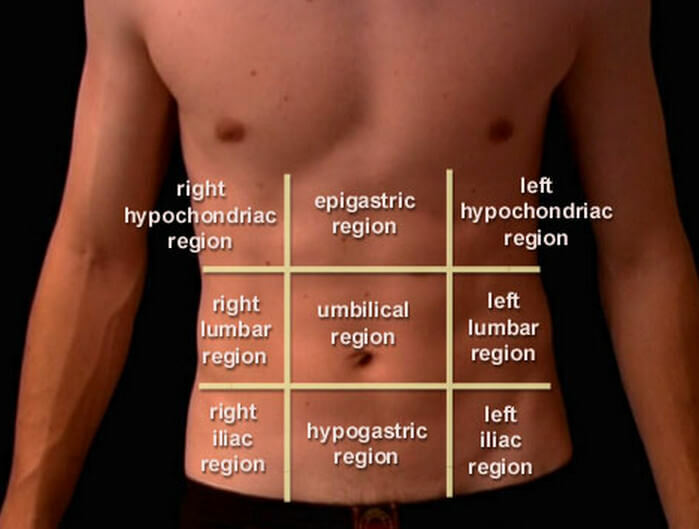 The abdominopelvic cavity is subdivided into either four quadrants or nine regions as an aid in locating organs. Upper right and upper left together with lower right and lower left constitute the four quadrants of the abdominopelvic cavity. The nine regions can be categorized as Hypochondriac, Lumbar and Iliac region on both left and right flank Epigastric, Umbilical and Hypogastric region in the center. To have a clear idea, have a look as the diagram below. The subdivision of abdominopelvic region is usually studied in the from of either four quadrants or nine regions for the sake of illness and pain assessment. Physicians may feel (palpate) or listen to (auscultate) the abdominopelvic region to examine it. Changes in firmness or sounds may indicate abnormalities in the structures of a quadrant or region. The four quadrants are formed by two planes that intersect just superior to the umbilicus (navel). The nine regions are formed by the intersection of two sagittal and two transverse planes. The sagittal planes extend inferiorly from the midpoints of the collarbones. The superior transverse plane lies just inferior to the borders of the 10th costal cartilages, and the inferior transverse plane lies just inferior to the superior border of the hip bones. Excluding the heart, the lungs and the brain, abdominopelvic cavity acts as a house for all the body organs. The liver, gallbladder, kidneys, spleen, pancreas, stomach, small intestines, large intestines, bladder, and internal reproductive organs can be found in this region.